So, I spent the holiday with my sister and her family and one of the best things about that, is I get to spend time with my nephew who is three. This time is particularly fun for me because he is a curious little guy and I get to share with him about my work and my expertise. We have gone over trees and shrubs, Paleozoic species (I buy him a different animal each year and this year was Tiktaalik), and anatomy (I got this three-year-old making humerus jokes). 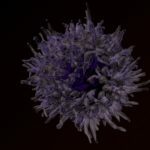 This year, I was working on an animation about Guillain-Barre syndrome, and I was creating a macrophage. Watching this showed me so much because it taught me how much content can be inferred just by a small 3-second animation even by someone as young as my nephew. I was prepared to tell him everything I knew about macrophage and what they did, but he understood that they were tiny and attacked things. At his age, that was all he needed to know, and he was off pretending. What’s more, while he was playing pretend, his reenactment of macrophage behavior (and a sincere belief that I too needed to pretend to be a macrophage) gave me a deeper understanding of macrophage movement and how to recreate it. The thing about my career, when it comes to illustrating something, I must fully understand it. That means if I am drawing a bison, I am going to learn everything from stance, gait, and behavior to the history of bison, including evolutional morphologies. Everything must be correct, so I become a mini-expert on whatever it is. What my nephew taught me, is while reading articles and using videos and photos for reference is helpful, sometimes you need to BECOME what you are creating. I don’t think an adult would have pushed me to use play to tackle another useful point of view. I thought I was going to teach my nephew something new this past week, but my nephew enlightened me instead. There is something amazingly interesting about how young kids learn and then reinforce that information by playing. I’m not saying that with every project I will be running around my house pretending to be whatever specimen I am currently working on, but I’m also not saying I am NOT going to do that either.